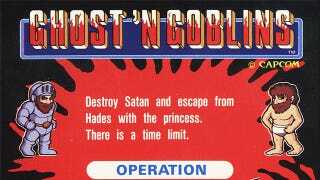 Destroy Satan and Escape From Hades? Sounds Simple Enough. I remember Ghosts 'N Goblins being about two things: underpants and skeletons. Mostly about underpants. It's easy to forget amidst all the cheesy humour of the game, then, that it had a fairly brutal premise. I mean, it's not like destroying Satan himself and then escaping the netherworld of Hades is tough enough. No, there is a time limit as well.